My name is Priyadarshini. I am a married mother of 4yr old. I live in Pune, India. I like to learn and explore new art forms. I am always engrossed in making creative crafts by using Eco-friendly and handmade items. I love to gift them to my friends and family. I started learning arts and crafts as a hobby, but now it has become a passion. I have also learned some of India’s fold art (Warli, Madhubani and Relief work Paintings) and international crafts (Paper Quilling, Punch Craft, Iris Folding, Lamasa). I don’t have an art background but I like to experiment with the art forms I learn. I also follow some of the expert’s tutorials to get inspiration but I make sure that my work has originality. I started my blog, Kalanirmitee July 2009. I want my blog to be a platform for sharing my craft ideas with all craft lovers. Priyadarshini is also one of my great contributing writers and artists on Going Green Crafters & Artists. Priyadarshini is SO talented. 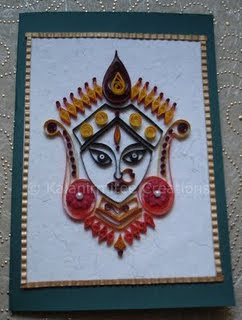 The quilling image is just stunning. I love the fact that crafting bloggers can visit one another no matter where in the world they are. It is a very special community. Wow - so talented! Her quilling is exquisite! 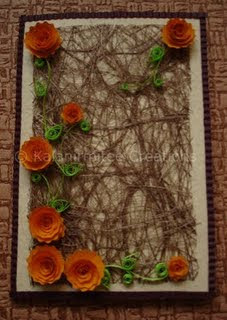 Beautiful quilling. TFS these talented crafters' work on your blog. Thank you very much, Monica. just stunning! I have tried quilling but dont have the patience...this is incredible! love seeing other's creativity from across the globe...thanks for sharing her with us!!! These are wonderful! Awesome talent!